In February, longtime CM coach Bill Hanson attended the Knights’ final game of the season at Walter Brown Arena — and sat on the visitors’ side. 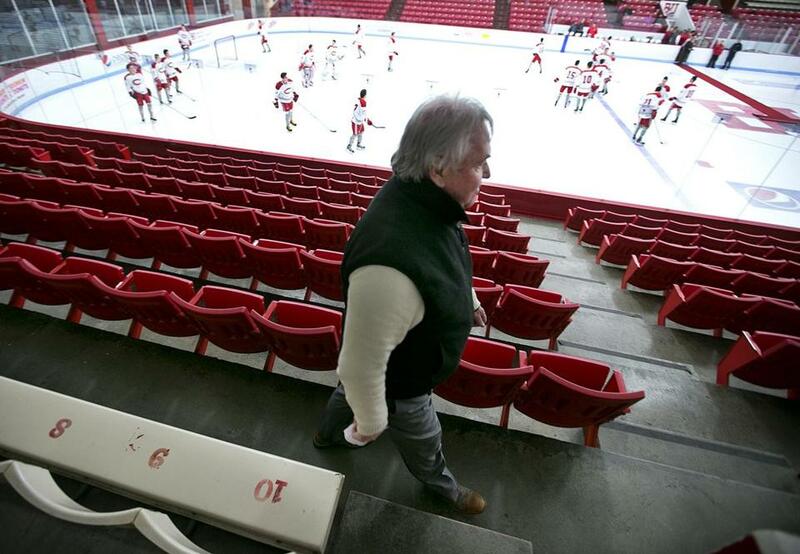 It has been a painful year for legendary Catholic Memorial hockey coach Bill Hanson, who was dismissed last May after winning a record 17 Division 1 state championships, 13 Super 8 tournaments, and six national titles in 38 years. He was hurt, and the wounds are still raw. But Hanson’s former players and coaches wanted to acknowledge the impact the coach had on their lives and the program, and they have organized “A Tribute to Coach Hanson” to be held at Agganis Arena Friday. The festivities will include a cocktail hour, banquet dinner, speeches, and a video tribute. Ticket sales have exceeded organizers’ expectations. “It’s going to be big-time,” says Hanson, 66, who hopes to raise money for the Mark Bavis Leadership Foundation and the Massachusetts Soldiers Legacy Fund. Bavis, a Catholic Memorial alumnus and former NHL scout, was killed in the Sept. 11, 2001, terrorist attacks. The rift between CM and Hanson was obvious when the coach paid his own way into Walter Brown Arena for the school’s final game of this past season against Braintree in February. It was the first time since Gerald Ford was president that Hanson attended a CM hockey game and wasn’t barking orders from the bench. A few CM players saluted their former coach by raising their sticks as he arrived early. Hanson returned a clenched fist as he and his former coaching staff took seats on the opponents’ side of the ice. It was the high school equivalent of seeing Bobby Orr in a Chicago Blackhawks jersey. Some felt the coach’s presence on the visitors’ side was a distraction. Hanson, who began his tenure in 1974 and accumulated 608 career victories — third-most in MIAA history — said he sat there so he could see the seniors’ faces as they skated out in a pregame ceremony. After the CM win, the seniors, parents, and former coaches went out for pizza. “It finally gave us closure,” said Hanson. Hanson wanted to coach one more season, but he said that school president Peter Folan told him, “We’re going to change the culture of the program and we’re going in a different direction.” He also lost his position as a guidance counselor. Donato said Hanson’s legacy went beyond athletics. Players, parents, and friends acknowledge that Hanson was an old-school coach. Pity the player who moved a muscle during the national anthem. Expletives could be fired off as frequently as shots on goal. Players went in and out of his doghouse, and parents were scared of him. Longtime associate head coach Jack Busalacchi said Hanson never minced words. Former Boston University coach Jack Parker, a CM alumnus whose coaching career spanned the same period as Hanson’s, agreed. Hanson said he simply wants to clear his name. Folan, in response to an interview request, e-mailed a statement. CM’s unprecedented hockey dominance has faded in recent years. The Knights failed to qualify for the Super 8 in three of Hanson’s last five seasons. His tenure ended after the team finished 6-10-4 in 2014-15, at that time its worst record in three decades. His replacement, former Bruin Mark Cornforth, went 5-13-2 this past season and failed to win a conference game. Cornforth stepped down after the season. Meanwhile, Hanson says he suffered coaching withdrawal pains. Now Hanson’s friends want to make sure he gets a proper sendoff. Former CM player Tiger Holland says Hanson is family. He recalls how the coach offered to house him after his mother died and his father had heart surgery. Peter Trovato, a former player and assistant coach, recalls how Hanson brought the entire team to church after his grandparents died in separate years. Trovato, founder of Copley Equity Partners, resigned from the CM board of directors after Hanson’s contract was not renewed. Hanson, the son of a South Boston electrician, knows he’s not always politically correct. Tom Noble, a CM Athletic Hall of Famer and a member of BU’s NCAA championship team in 1995, remembers being constantly late for school until Hanson parked himself by the front door with a stopwatch. Today, Noble runs a defense supply business of 200 employees that supports the US military. Hanson wasn’t afraid to discipline a star, either. Mike Sylvia, the school’s all-time leading scorer, once forgot his game jersey, and Hanson benched him. Sylvia’s mother went home and rushed the jersey to the locker room.